Journey to the world of the Nightrunners, as Lynn Flewelling concludes her popular cross-genre series about partners Alec and Seregil with Shards of Time. This time the noble spies are sent to investigate murder, ghosts, and forces from beyond death on the sacred island of Korous. Join us to talk espionage, courtly behavior, tea, the fantastic, Jared Leto look-alikes, and what to look for in the future with Lynn. Shipping notes: Within the United States, media mail is the least expensive at $5.00. The other options range from $10 to $12 but are faster. International Shipping is set by the system and is often adjusted down to fit a particular book. For example, one of Lynn's paperbacks to Europe and Australia will cost $15 First Class and $24 Priority, to Canada it would be $10 First Class and $20 Priority. Journey to the world of the Nightrunners, as Lynn Flewelling continues her popular cross-genre series about partners Alec and Seregil with Casket of Souls. This time the noble spies are caught in a web of treason and intrigue that threatens the court and their own loyalties, as a deadly plague adds its own menace. Lynn Flewelling discusses Shadows Return. 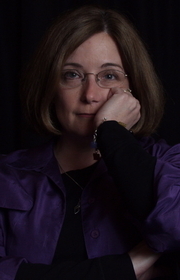 Lynn Flewelling is currently considered a "single author." If one or more works are by a distinct, homonymous authors, go ahead and split the author. Lynn Flewelling is composed of 3 names. You can examine and separate out names.